Last night I received an email from a lady who had read some of my blog posts, probably specifically this one about William Lewin that I wrote nearly four years ago. I had known that the OH's great grandmother Edith Alice's first step father had died in 1901 but I had been unable to find out why or where at the time. 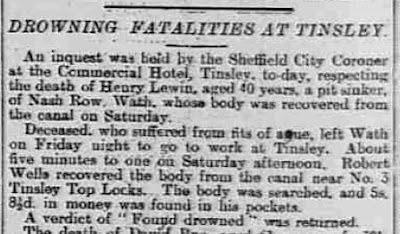 My correspondent told me that he had drowned in the Tinsley Canal and in her second email she sent a newspaper cutting. Henry's address fits with the address I found the family at in the 1901 census, No 10 Court 1, Doncaster Road, Wath on Dearne. Nash Row was the name given to a long street of houses built just south of Manvers Main Colliery No.2 pit between 1868 (when the shaft was first sunk) and 1881 (when apparently 246 people were living there). My information comes from the back of my Manvers Main 1901 Alan Godfrey map. 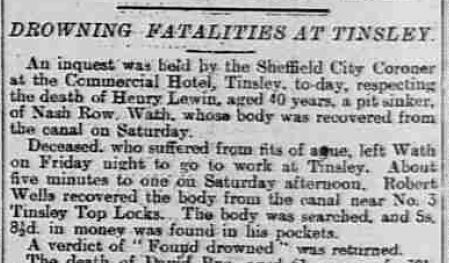 There are a lot more Yorkshire records online now than there were four years ago so I was quickly able to find Henry's burial on 25 April 190 at Wath on Dearne in the Yorkshire Burials on Find My Past. It didn't tell me anything more than the newspaper report had done though I was inspired to search the rest of the FMP records for any other mentions of the Lewin family. Nope, nothing relevant except a marriage I already had. Minnie Lewin remarries within the year to Albert Green (later George Albert Green) at St Margaret's parish church in Swinton. Her address in March 1902 is 35 Temperance Terrace which is less than two miles away. I already had this certificate having sent for it many years ago (2009) when I was first trying to sort out the problem of Edith Alice and her mum. Now available as part of my FMP subscription! By 1911 Minnie and George Albert Green are at 5 Packman Road in West Melton, about three miles from Swinton in the Barnsley direction. Living with them are Alice Lewin (who is actually Edith Alice Pagett, born before Minnie's marriage to Henry), Ada Lewin (Minnie's only legitimate child with Henry Lewin), Maud Elizabeth (born in the December quarter of 1902 in Swinton), Minnie (birth registered March quarter 1905 in West Melton) and Richard Albert Green (born March quarter 1910 in West Melton). Confusingly George states that they have been married for 15 years, which is a fib, as they only married in 1902! He also declares that they have lost one child, whom I know was George Albert Green, who was born and died in 1907. I had previously been able to find George and Minnie in the Electoral Rolls in Barnsley after the First World War. They were living at 28 Albion Road, Stairfoot in 1919 and 1930. In the intervening four years the 1939 Register has been released on Find My Past so today I followed them up on that as well. Their address on 29 September 1939 was 8 Lambert Walk, Kendray, Barnsley. George was a Retired Boiler Fireman and both his and and Minnie's birth dates are given, details I hadn't had before. Minnie died in 1941 and George in 1945 and both are buried in plot E 251 at Ardsley Cemetery. The OH and I once went out there to take a look but sadly there is no headstone marking their grave. Well, that has nicely tidied up the OH's connection to the Lewin family but in the process I did a lot more digging around to find out more about Henry and his first wife and it was very complicated to say the least. More later!